BASIS Independent Silicon Valley was a proud exhibotor at Maker Faire a few weekends ago. 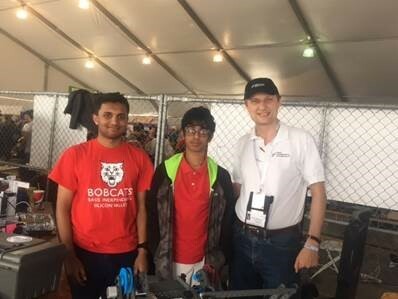 We had a chance to interact with lots of students and families from all around the Bay Area who were very impressed with the work our Engineering and Robotics students have done. Dr. Amin brought several student built robots, an earthquake simulator and some of the first projects that the engineering students begin working on to learn about circuitry and soldering. We were in good company with many other inventors, cool gadgets and a boundless supply of creativity. The title of this blog pays homage to just a few of the amazing contraptions and apparatuses on display at the Faire. A myriad of fun opportunities and activities kept kids and adults alike engaged: from bubble wrangling to never ending art projects and learning how to solder, there was never a dull moment at Faire. Most of the guests immediately donned the safety goggles that were handed out as they entered, so whenever you looked out over the landscape, it appeared that we were surrounded by a group of people who were ready for fun! We certainly consider our first year at the Maker Faire a success and are excited to return in 2017. Maker Faire is a unique showcase for exploration and learning--ideas we can certainly support at BASIS Independent Silicon Valley! Thank you to all of our students who came out just to visit our booth (even if you stopped by to hug a robot and pick up some pro gardening tips from the innovators in the Homegrown Village)--either way, we were so excited to see you at Faire.